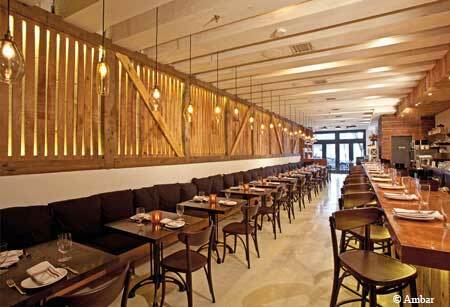 Authentic and totally unique Balkan cuisine with a few modern twists. : In the heart of DC, Ambar offers one of the most interesting and least familiar cuisines. The Balkan dishes include a mushroom “flatbread” starter that’s really a layering of assorted mushrooms with arugula and cheese; a platter with freshly baked breads and what look and taste like popovers; slow-cooked pork and skewered grilled shrimp. Most dinner dishes are tapas-style, so be sure to order a selection to appreciate the diverse and rather unusual fare. Or consider the two “for-two” options of a medley of sausages or a mixed meat platter that presents sausages, pork loin, a Balkan burger and a Balkan kebab. The brunch menu ranges from sandwiches and egg dishes to soups, and pastries and crêpes. For dessert, the unique Balkan creation called the “The Four Chocolates” is a must for anyone with a hankering for chocolate flavors. And while you will find various wines and cocktails, perhaps the most legitimate and native beverages are those called “rakia,” made from distilled fermented fruit juice and packing a potent punch, poured into miniature brandy glasses.